Origin and Habitat: Garden origin (Nursery produced cultivar) Plants obtained by controlled pollination of ♀ Astrophytum ornatum x ♂ Astrophytum myriostigma cv. ONZUKA. 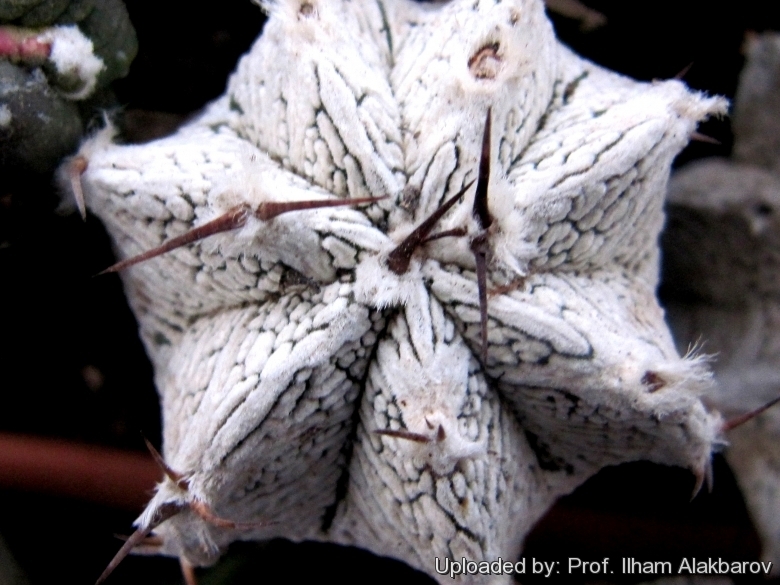 Description: Astrophytum hybrid ONZ-OR (A. myriostigma cv. Onzuka x A. ornatum) cv. White Zebra (a.k.a. White Tiger) is a selected form with very white stripped stems. The superb feature of this hybrids is due to the intersection between the traits of the ancestors and make them very desirable. The more beautiful the pattern and the markings, the more sought after the plant. They have inherited by “ONZUKA” the very large, white wholly flecks with V mark. Ribs varies from 5 to 7 and are spineless or with short spines, clearly indicating the relationship with Astrophytum myriostigma.